One of the biggest changes that has occured in Savile Row in the last few years is, sadly, the departure of cloth merchants who actually hold stock either on or around Savile Row. It’s the same old story – rent and rates have got so high that the cloth merchants can’t afford to pay for valuable Mayfair office space, to be used for holding bolts of cloth. 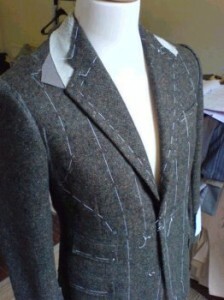 Although the main players are still doing well, like us tailors they now only stock the pattern bunches from which you can select your fabrics. The bolts (i.e. the hundred metre rolls) are kept elsewhere. These small shops are all still supplying some of the finest cloths in the world, but gone are the days where you could pop round to Lessers, for example, and drape a full piece of cloth over a customer’s shoulder to give an idea of the final outcome. Happily, Smith Woolens is a super company which still offer this service. They’re still local – based in Soho, the next neighborhood over – which is comforting to know. 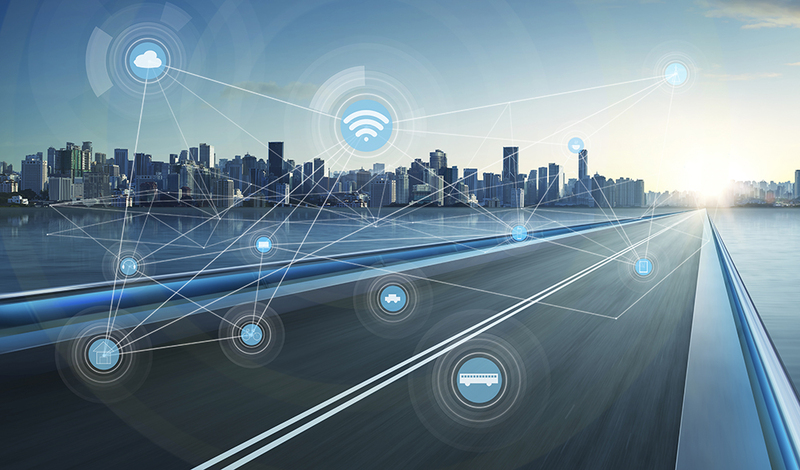 But most firms have relocated their stock to less expensive parts of the city, or even the country. Some cloths are even housed housed in warehouses abroad by some of the merchants, even though the cloths were manufactured in England. I don’t blame these guys, like everyone else they have to adapt to survive. But as usual, if you know who to ask and where to look, Savile Row always has a pleasant surprise to defy modern thinking and commercial logic. 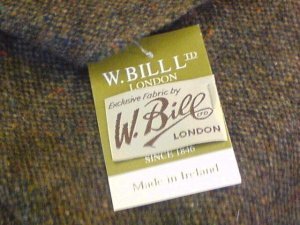 One lovely example is W. Bill Ltd, established in 1846. 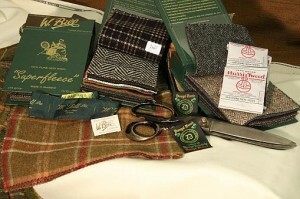 Today they’re best known in our business as THE tweed and cashmere specialists. They actually have the same owners as Smith Woolens. Any tailor worth knowing, certainly in the UK anyway, should have a relationship with both these establishments. If you’re fortunate enough to have your clothes made on the Savile Row, you may just get the chance to visit. These are not retail outlets, so don’t go banging on the door, but if you’re looking for a tweed or cashmere at W. Bill’s, or quality worsteds at Smith’s, they’ll let you in, provided your tailor acts as chaperone. 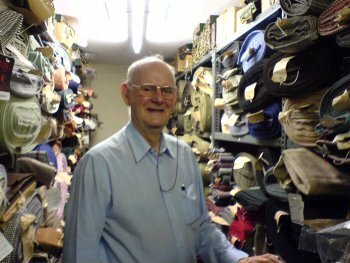 I recently took a customer of mine round the corner in New Burlington Street to visit Mr. Ray Hammett, of W. Bill Ltd. It’s always a lovely experience dealing with all of the guys in that basement office. My customer was looking for a Donegal tweed, but couldn’t quite make up his mind. So with a two-minute walk to Ray’s, a scratch of his head and a knowing “hmmmm”, we were able to roll out several full pieces of beautiful hand-woven Donegal tweed to help my customer decide. Ray Hammet, the “curator” of the vaults at W. Bill Ltd.
Everyone I take there is astonished to find such a cachophony of just about every type of tweed and cashmere ever woven. The way the cloths are piled up on the straining shelves reminds you of the holding vaults of ancient treasures in the British Museum. Apart from the amazing fabrics, there are little glimpses of the company’s 150-year history, dotted all over the place. I always chuckle, as on our departure Ray always asks about the weather. I know this is a famously English obsession, but Ray actually means it. Bearing in mind he’s locked in a basement all day with no windows, it’s understandable. Maybe that’s why he looks so good- he loves his work and dosen’t let all that aging sunshine anywhere near his face. Once again, it’s people like Ray that make me adore this little street they call Savile Row.